WHAT WOULD IT BE LIKE TO HAVE THE TASTE OF LEMON, LIME, ORANGE & GRAPEFRUIT IN A SINGLE FRUIT? This citrus bounty is found in Passion Fruit. We infuse this hard-to-find tropical fruit in our aged white balsamic. There's no need to fuss with seeds or pulp or the long wait for the fruit to ripen before you can use it. And there's nothing better than marinating with Passion Fruit. We've created two recipes that celebrate it. One that adds a bit of chipotle spice and another that uses grilled fruit. Shrimp prepped in our Passion Fruit marinade makes a perfect appetizer or main meal simply by applying a careful grill or pan sear without overcooking. Tip: Drizzle with our Chipotle olive oil. Preheat grill to medium. Slide about 5-6 shrimp onto each skewer. In a small bowl mix remaining ingredients. 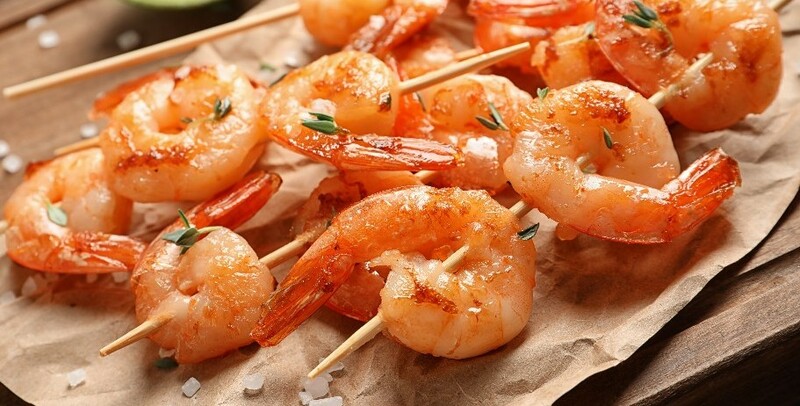 Place skewered shrimp in shallow baking dish. Pour mixture over shrimp and leave for one hour. Brush off extra mixture before cooking. Leave on grill or saute for 2 minutes per side or until barely opaque. Remove from grill and place on platter then generously drizzle Chipotle olive oil to taste. Serve immediately.